Monday marks the last trading day of the first quarter of 2014. The first three months of market action this year have been anything but similar to the first three months of 2013. In the first quarter last year, the S&P 500 Index returned over 10%. Before trading on Monday, the first quarter return in 2014 equals about .5%. As the below chart shows, January saw some profit taking after strong returns in 2013. 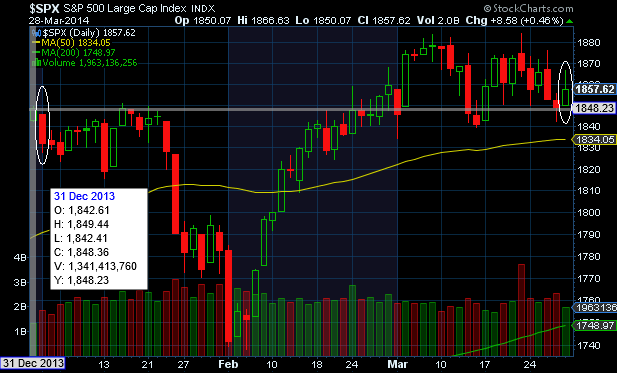 The S&P 500 Index recovered the January losses in February and proceeded to generate positive returns in March. However, as the below chart shows, the market is near breakeven for the quarter. A number of article links in this week's magazine highlight economic data, both in the U.S. and in the euro zone, that indicates the global economic environment has stabilized and is growing moderately. Recently, changes in investor equity market sentiment have followed changes in the S&P 500 Index. 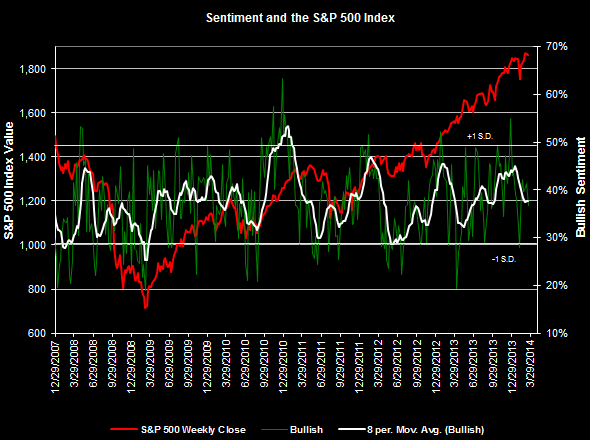 As the market declines, bullish investor sentiment has declined as well. 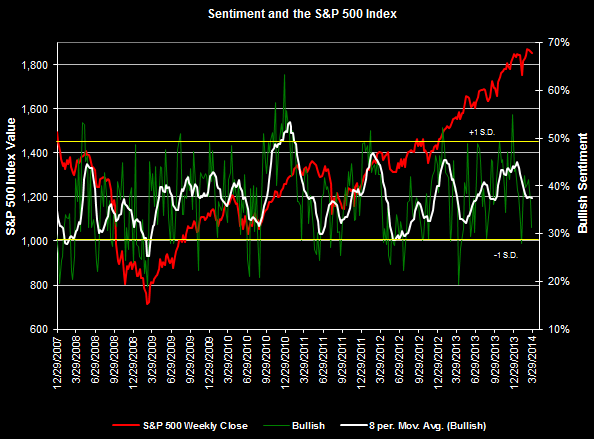 True to form, bullish sentiment fell this week as reported by the Association of Individual Investors. Bullish sentiment fell over five percentage points to 31.2% versus the prior weeks level of 36.8%. The long term bullishness level is 39% and one standard deviation below this average is 29%. 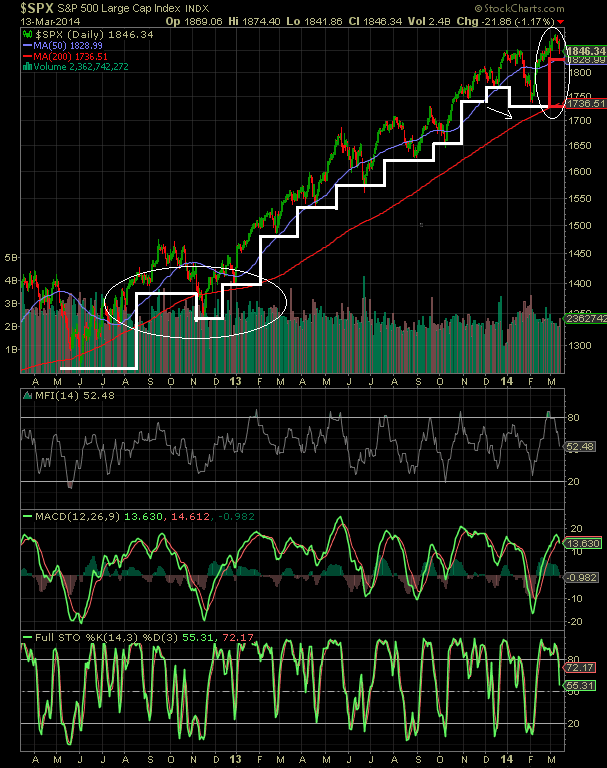 Consequently, this level of bullish sentiment is nearing levels seen at prior market bottoms. Readers should keep in mind this contrarian indicator is most accurate at the extremes. Quite a bit of discussion has occurred over the past several days regarding the fact value stocks are outperforming growth stocks. This outperformance has taken place since the beginning of March as can be seen in the below chart. In looking at a longer view of the value growth cycle, growth had been the outperforming style since April of last year. "Following periods when short-term rates ease, lending activity and subsequently business development typically accelerate. During these periods value stocks, led by financial and industrial companies, begin to outperform. As the global economy begins to expand, demand for basic materials, such as metals, and energy related commodities, such as oil and natural gas, rises. That leads to an increase in the price of these commodities which in turn has historically led to the outperformance of the stocks of commodity producers and processors." "As in the case of an economic slowdown, the monetary response to economic expansion is also typically delayed until sustained signs of acceleration in inflation are apparent. In response, central banks begin to hike short-term interest rates to the point where the interest rate yield curve is flat or inverted, i.e. short-term rates are either equal to or higher than long-term rates. Lending activity to businesses then typically slows significantly, profits of financial institutions decline, and financial stock prices begin to lag the market averages. Economic activity moderates, and once again those stocks that can grow their earnings at the fastest pace, namely, growth stocks, typically resume a period of multi-year outperformance." In short, as the economy begins to accelerate, value companies begin to outperform. Conversely, when the economy begins to slow, those companies that can grow their earnings in spite of the slowing environment (growth stocks) will begin to outperform. 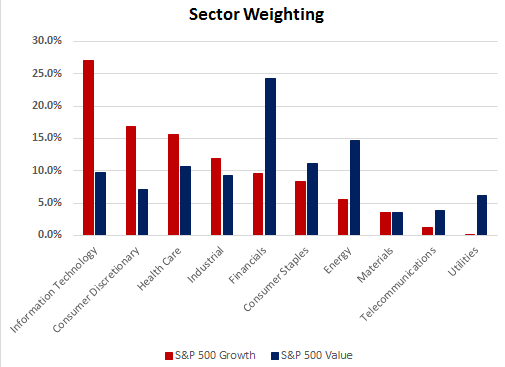 Below is a chart comparing the sector weightings for the S&P 500 Growth Index to that of the S&P 500 Value Index. Additionally, the last two charts show the top holdings for each of these indexes. The stock market does tend to be a pretty good weighing machine on future economic activity. If the value style is in fact beginning to assume market leadership on a sustained basis, maybe economic activity is improving. We noted this fact in our post last week highlighting a few economic variables that would be indicative of a strengthening economic environment, Economic Data Continues To Support A Stronger Equity Market. For investors, looking at value stocks that have lagged the market advance that occurred in the second half of 2013 could provide some rewarding investment opportunities. In a recent white paper by Fidelity Investments the authors show that valuation in and of itself is a poor predictor of future short term market returns. The report evaluates a number of valuation indicators, including the Shiller CAPE, and points to some shortcomings with the CAPE calculation. In addition to Fidelity, Jeremy Siegel has highlighted issues with the CAPE calculation. Nonetheless, valuation is certainly important for investors to pay attention to as they allocate investment dollars to equity. The Fidelity report does show that valuations are a much better predictor of longer term market returns. As we noted in yesterday's post, Equity Market Continues To Track Like the 1990s, one characteristic over the past two years similar to the mid 1990s is the fact multiple expansion has enhanced recent equity market returns. Like Fidelity, at HORAN Capital Advisors, we to believe multiple expansion is likely to continue to enhance returns over the near term. 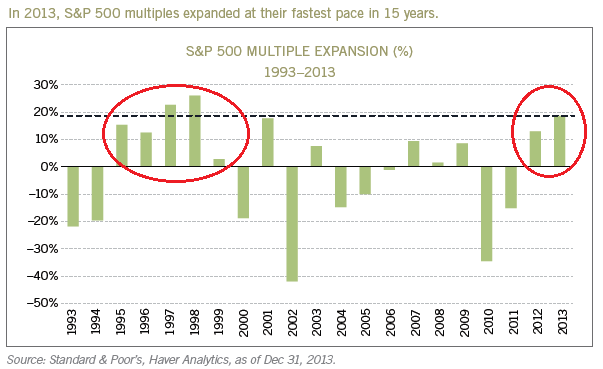 The below chart shows the role multiple expansion had in the mid 1990s compared to the returns in 2012 and 2013. The Fidelity report includes commentary on valuation measures beyond CAPE and trailing and forward PEs. We have written about the importance of looking at alternative measures of valuation like P/NIPA (price to national income and product account corporate profits) and P/CF (price to cash flow.) Both of these measures have benefits and disadvantages; however, they do make an effort to look at a more comprehensive economic earnings picture or evaluate earnings excluding one time write-offs. No one measure is a panacea in determining the "right" valuation for the market. However, there is enough data provided by these alternative measures that gives some confirmation that multiple expansion can continue to have a positive impact on large cap equity market reurns in the near term. At HORAN Capital Advisors we have written commentary several times over the past six or so months noting similarities of the current equity market advance to market similarities in the 1990s. Our third quarter 2013 Investor Letter cited multiple or P/E expansion. We also posted a follow-up comment in our January 1, 2014 post, Expectations For The Market In 2014. 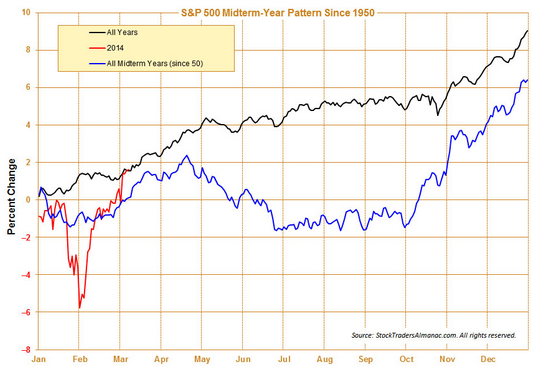 In the January post we included a chart noting the calendar year returns for the S&P 500 Index in the mid 1990s. Today, Ed Yardeni of Yardeni Research provided an updated chart noting the current market advance begining in 2009 to the market advance for the period 1990 - 2000. 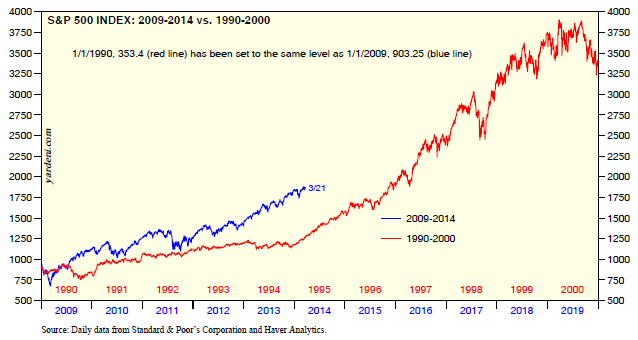 As the below chart shows, the current advance continues to mirror the pattern of the 1990 - 2000 period. "The Wealthy Hand-to-Mouth," by economists at Princeton and New York University, finds that roughly one-third of American households -- 38 million of them -- are living a paycheck-to-paycheck existence. These are families who hold little to no liquid wealth from cash, savings or checking accounts. But a staggering two-thirds of these households are not actually poor; while they resemble poor families in their lack of liquid wealth, they own substantial holdings ($50,000, on average) in illiquid assets (emphasis added). Because this money is locked up in things like their houses, cars and retirement accounts, they can't easily dip into it when times get tough. I hate to break it to many readers, but an individual or family that has an average of $50,000 in illiquid assets and no savings will not live a comfortable retirement. The conclusion of the article states this type of individual should be eligible for government entitlement programs. The article refers to these entitlements as "economic stimulus programs." The first quarter of 2014 is coming to an end rather quickly. Appropriately, March Madness not only applies to basketball, but potentially to the market. One article in this week's magazine provides historical performance detail on both the Dow and the S&P 500 Index during the closing days of past first quarters. Additionally, a Lipper article notes investor flows into equity funds have been positive, while, at the same time, bullish investor sentiment has weakened. With the below link to this week's magazine, enjoy some of the articles as we near closing out the first quarter. 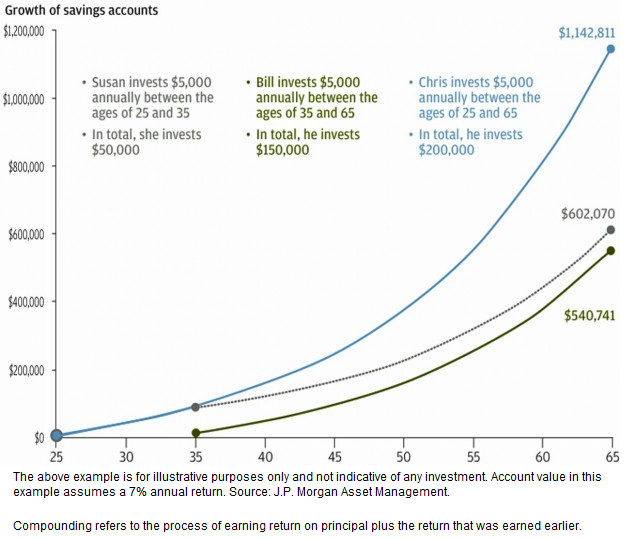 In J.P. Morgan's recently released Guide To Retirement, one chart in the guide notes the advantage of beginning a savings program at an early age. The early start to a savings program generates its payoff due to the power of compounding. Compounding refers to the process of earning return on principal plus the return that was earned earlier. I believe the below chart speaks for itself, but with entitlement reform an almost foregone conclusion, retirees will need savings outside of government provided programs like social security. Retailing has never been an easy business. Consumer tastes and preferences are ever changing. 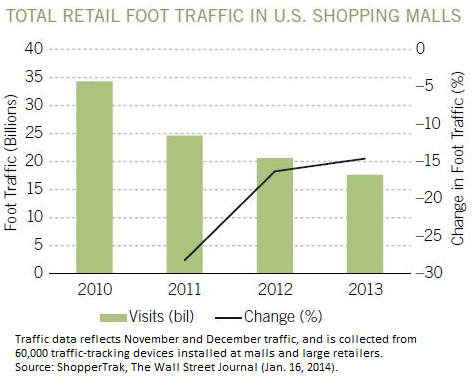 In a recent report by Fidelity Investments, they note the trend in foot traffic at malls has been on the decline over the past three years. "The growth of mobile devices and the increased accessibility of online pricing have helped fuel increased Web sales. Through the first three quarters of 2013, e-commerce sales increased by 17.4% over the same period in 2012 [according to the U.S. Census bureau]. Today, consumers increasingly turn to their smartphones and tablets to comparison shop on multiple sites simultaneously, rather than travel from store to store for the lowest prices. Purchases can often be delivered within a day or two, at either a nominal shipping expense or free of charge. Further, merchandise returns have been streamlined, as many e-commerce retailers send prepaid return shipping labels to customers with their purchases, removing yet another obstacle to shopping online." In spite of the potential difficulties facing retailers there are retail segments that seem to be navigating this transition favorably in the opinion of Fidelity. Retail destinations catering to a healthy lifestyle. Warehouse clubs with a varying general merchandise offering. More detail can be found in the Fidelity report link below. The American Association of Individual Investors reported bullish investor sentiment fell 4.56 percentage points to 36.78% versus the prior week's bullishness reading of 41.34%. The AAII Sentiment Survey measures the percentage of individual investors who are bullish, bearish, and neutral on the stock market for the next six months. The percentage decline in bullishness was reflected in an increases in a neutral tone by investors as neutral sentiment increased over five percentage points. Investors are certainly uncertain about the future direction of the market and have been quick to change their sentiment bias upon short term declines in the market. The decline in bullish sentiment this week follows last week's market decline of 1.9% as noted in the below "weekly" chart of the S&P 500 Index. "Manufacturing production recorded an increase of 0.8 percent in February after having decreased 0.9 percent in January. Much of the swing in the rates of change for production in January and February reflected the depressing effects on output of the severe weather in January and the subsequent return to more normal levels of production in February. The level of factory output in February was 1.5 percent above its year-earlier level. Capacity utilization for manufacturing moved up 0.5 percentage point in February to 76.4 percent, a rate 2.3 percentage points below its long-run average." The below chart compares industrial production (a coincident indicator) to commercial and industrial loans at all commercial banks. And finally, the improvement in Industrial Production does coincide with an improved equity market as can be seen in the below chart. The above three measures are now reaching post recession highs. Maybe there is truth to the often cited weather related impact with recent earnings releases. As we leave winter behind, pent-up demand could drive further improvement in economic activity. In just a few short weeks geopolitical events seem to be the top market concern and thus taken steam out of the bull market run. The Ukraine/Russia/Crimea issue seems to have reached a near term conclusion with Crimea appearing to vote today for leaving Ukraine and joining Russia. This geopolitical event seemed to impact market returns this past week with the S&P 500 Index declining 2.0% and the Dow Jones Industrial Average falling a larger 2.4%. This situation will certainly influence market returns early in the coming week. Additionally several important economic reports will be reported this week with the mid week Fed announcement. As much of the economic data has been mixed throughout the market's advance from the financial crisis lows back in 2009, the sentiment data is mixed as well. Gallup reports an uptick in investor optimism and I highlighted the report in this week's magazine. On the other hand, Econoday's report on last week's Reuter's/University of Michigan's consumer sentiment index noted, "Consumer sentiment is dipping this month but not the assessment of current conditions. 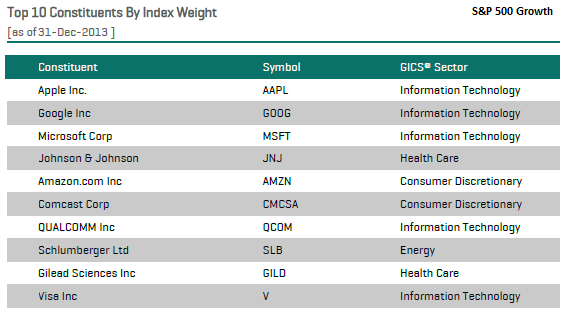 The composite index is down 1.7 points at mid-month to a lower-than-expected 79.9, but the current conditions component is actually higher, up 7 tenths to 96.1 to indicate comparative strength vs February." For investors then, news events this week will certainly provide a reason for market volatility early in the week. Below is the link to this week's magazine. The Dow Jones Industrial Average fell over 230 points yesterday (-1.41%), the S&P 500 Index declined a lesser 1.17% and many market participants are evaluating whether this is the beginning of a more prolonged market pullback. Market technicians are citing a number of technical factors that may be a precursor to a more sustained market decline. One factor which has been getting a lot of attention is the declining number of stocks within, say the S&P 500 Index, trading above their 200 day moving average. Thomson Reuters' AlphaNow site published an article yesterday and written by ETF Guide, Is The Bull Market Weakening Or Gaining Strength? A chart included in the analysis was the one below that clearly shows a declining percentage of S&P 500 stocks trading above their 200 day moving average. "The broader index may be making new all-time highs, but less and less of its components are. This means the market is being driven higher by fewer and fewer companies and solely by those companies with the biggest market caps that have the larger effects on the indices (emphasis added)." However, instead of the larger capitalization stocks driving the market to new highs, it is the smaller cap stocks. The below chart shows the mega cap stocks (white line), the Russell 200 Index, and this index is actually underperforming the more comprehensive S&P 500 Index. The next chart shows the S&P 600 Small Cap ETF compared to the S&P 500 Index. In this case as well, small caps are outperforming large cap stocks. Ryan's article provides a detail review of future small cap returns when small cap stocks are trading at levels similar to today. At HORAN, we eliminated and/or reduced small cap exposure in our clients' accounts recently due to valuation concerns. So getting back to the AlphaNow article question, Is the Bull Market Weakening? 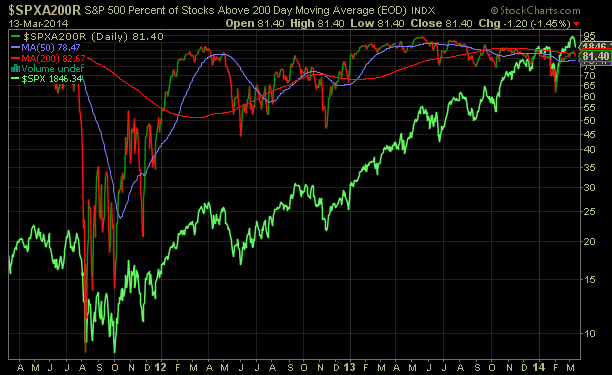 The issue of the declining number of stocks above their 200 day moving average is certainly an issue worth watching. However, as the below chart shows, last year the market generated returns in excess of 30% at a time when a smaller percentage of stocks in the S&P 500 Index were trading above their 200 day moving average. Also, looking at a broader index like the NYSE Composite Index, the percentage of stocks trading above their 200 day moving average has been increasing this year. The NYSE Composite consists of 1,867 companies (1,518 of which are U.S. companies.) In actuality, maybe we are seeing a broader more global participation in this market advance. From our firm's perspective, consolidation of market gains generated over the last year and a half would be constructive for another move higher for the market. 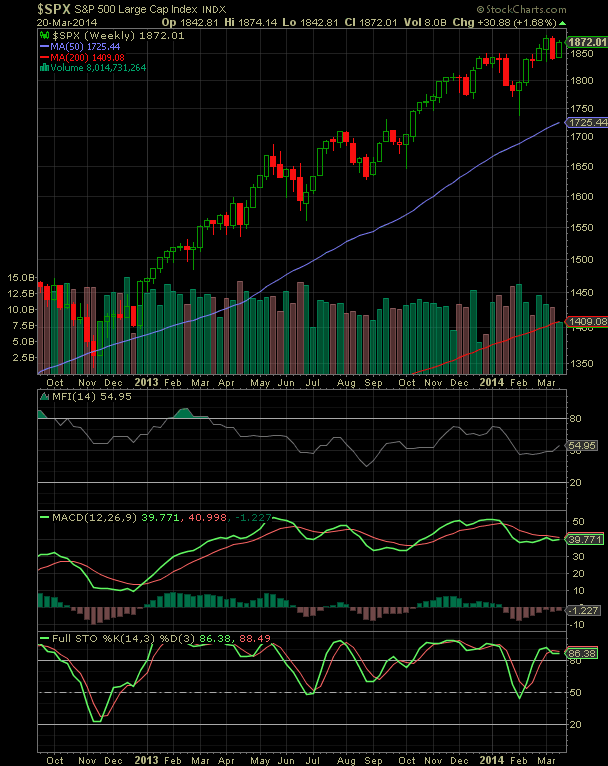 The market has consistently stair-stepped its way higher since late 2012. 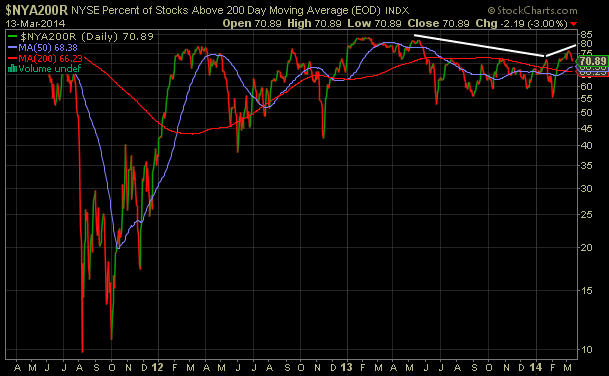 However, from a technical point of view 2014 could be a more "sell in May" type of year. Over riding these technical issues will be company fundamentals. Weather has been the excuse of the day for poor earnings reports for a number of firms reporting over the last 60 to 90 days. Additionally, geopolitical events (Russia/Ukraine) are also influencing recent market actions. We will address more of these issues in our upcoming first quarter investor letter. "The Dow Jones Industrial Average has soared 151% since stocks bottomed March 9, 2009, following the financial crisis. That ranks it fifth in gains among the 32 bull markets since 1900." "It also is tied for fifth-longest-running, in trading days, with the one that ended in 2007, according to Ned Davis Research." "If the current stock advance lasts another 16 trading days, it will be the fourth-longest, surpassing the one that ended in 1987." "The Nasdaq Composite Index is up 242%, and the Russell 2000 small-stock index is up 251% in that time. A bull market is commonly defined as a gain of at least 20% from a market low." This week's magazine contains a few articles that reference the bull market run since the end of the financlial crisis. Also, the magazine contains useful links to artiucles on topics for the coming week. Tuesday was the largest single-day outflow ever for BlackRock Inc.'s (BLK) iShare's fixed-income ETFs, a spokeswoman said. Some $6.2 billion poured out of bond ETFs on Tuesday as investor concerns over Ukraine cooled, driving a global stock-market rally and a selloff in safe-haven bonds. Tuesday's bond ETF withdrawal was equal to roughly 2.5% of the $240 billion bond ETF market, according to research and analysis firm ETF.com. In contrast, some $1.9 billion flowed into U.S. stock funds Tuesday, representing 0.2% of total assets. From a fund flow perspective, the blue bars in the below chart displays the rolling one year sum of fund flows into equity mutual funds versus the move in the S&P 500 Index. In spite of the strong positive return in the S&P 500 Index since the bottom of the financial crisis in 2008/2009, it appears investors are just now beginning to reallocate their investments into equity assets. The second chart below compares the monthly net fund flows between equity and fixed income investments. This chart also suggests the flows out of fixed income are just recently beginning to take place. With the strong market rebound in February, the dividend payers in the S&P 500 Index have continued to lag their non-dividend counterparts. 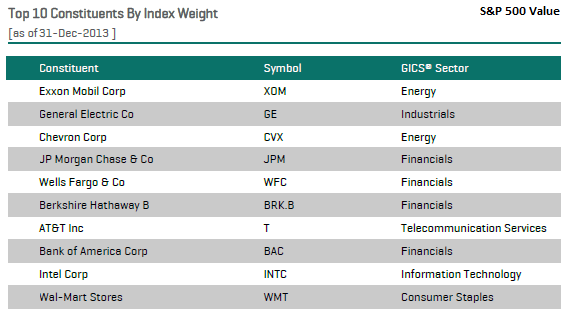 As the below table shows, the equal weighted return for the non-dividend payers outperformed the payers by 2.61 percentage points in February. On a year to date basis, two months, the non payers have outperformed the payers by a large 6.73 percentage points. With this large of an underperformance by the payers, it could an uphill battle for the payers to close this gap by year end. Seems logical to say today after the sharp snap-back in global equity markets; however, past crisis have generally provided investors with good buying opportunities versus selling. As we noted in our post over the weekend, the Ukraine crisis was/is likely to not have a long term negative impact on global market returns. Last September Sam Stovall of S&P Capital IQ issued a report highlighting prior geopolitical crisis' impact on the markets and the subsequent recovery period. The average days need to recover from the loss is 14 days. The below table highlights the "shock" events and impact on the market. Much of the market's focus starting the week has turned to the potential impact of Russia's invasion of Ukraine (Crimea). As I am writing this post, S&P 500 futures are down just under 1% or 17.7 points to 1,839.90. The night is long so much can change as it relates to the market's ultimate reaction to the events in Ukraine on the first trading day of the week. A similar scenario played out in August 2008 during the Russia/Georgia conflict. At that time the market pretty much traded sideways until the flair-up of the financial crisis in the U.S. This type of conflict between Ukraine, Russia and the West is likely not to have a long term negative impact. The Georgia conflict did not and some of the conflicts in the Middle East have not as well--Syria comes to mind. Nonetheless, the below link to this week's magazine focuses entirely on articles related to the conflict in Ukraine. 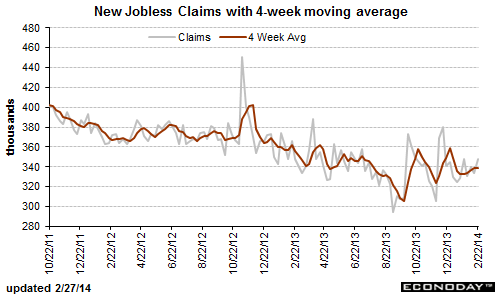 Jobless claims are not pointing to any improvement in the labor market with initial claims up 14,000 in the February 22 week to a 348,000 level that's just outside the high end of the Econoday consensus. The 4-week average is unchanged at 338,250 which is slightly higher than the month-ago trend in a reading that points to no improvement (emphasis added) for the monthly employment report. What is concerning about the report is the fact the trend, both weekly and the 4-week average in claims, continues to move higher since the end of the summer last year. The recent JOLTS (Job Openings and Labor Turnover Survey) provides an indication that job openings continue to rise (blue line, below chart). There does appear to be a mismatch in this rising opening trend and those that are "not in the labor force but want a job" (red line, below chart). 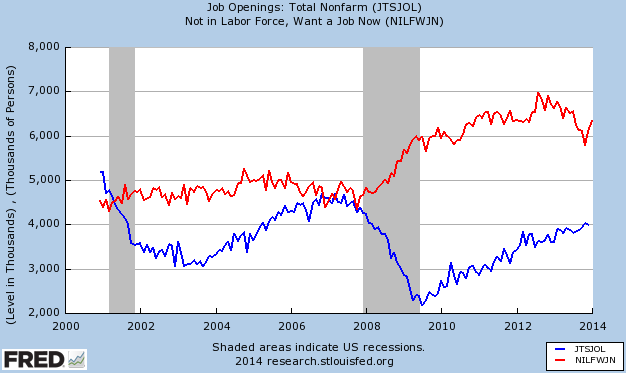 Since the end of October the "not in labor force but want a job" line has turned higher. So in spite of the improving JOLTS report, the trend is worsening for those seeking a job. A silver lining may be the fact small business optimism is higher than it has been in several years, yet below prerecession highs. 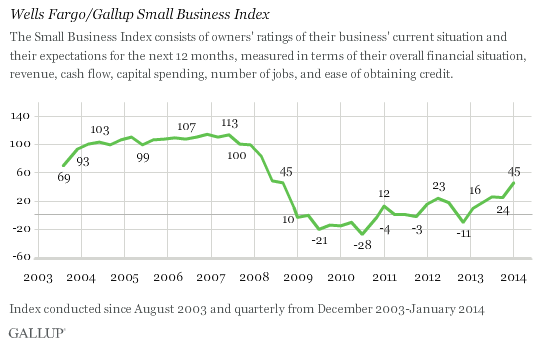 The Gallop report notes small business hiring expectations improved from 16% in Q4 2013 to 22% in the poll taken in January. The recent worsening situation for the unemployed yet wanting a job seems rooted in the fact there is a mismatch in the skills needed for the open positions. A recent Federal Reserve paper discusses this situation that has resulted in an outward shifting Beveridge Curve. In an economic environment with slow economic growth, this mismatch between skills and job openings will likely continue to result in an elevated employment market.